Here's a thing: I adore mountains but am terrified of heights. I can thus stare at a mountain range all day, marvel at its beauty and majesty, but I'll do so from the ground if that's all right by you. Just recently I was in Italy and went on a coach trip to gawk at the Dolomites, the country's very own Alpine mountain range. As we approached, the views became increasingly impressive, but the tour guide assured us we were going to a place where we'd get a much better look. Yeah, at the top of one of them. It was the sort of winding, endlessly upward journey that provides you with repeated and extended flashes of your past life and made me wish I'd never come to Italy in the first place. Until we reached the top, that is. The views were – and I can't find another more creative word for this – just stunning. Was it worth that terrifying drive up and the apprehension of a return journey? I'd have to say it was. Would I do it again? At a pinch, yes. Would I climb up the side of one of them with only spiked shoes, pins, a hammer and some rope to get me there? No bloody way. Mountaineers are a different breed to the rest of us. For them it's not about enjoying the view from the top but the climb itself, the physical effort and endurance required get where few, if any, have gone before. I've had friends who were rock climbers and they could converse for hours about the difficulty of a particular rock face, the obstacles they had to overcome, the risks they took. Is it about proving themselves in that particularly male manner? Perhaps a little, but then one of those friends was female, and if you're looking to show off your physical abilities to others then climbing with a couple of friends up an isolated mountainside is unlikely to fit the bill. It's something I've never done and never really wanted to do – a fear of heights is a bit of a handicap for even the most timid mountaineer – but I do understand its appeal. It represents an adventure, a risk, an exploration in a world in which such activities are limited and often corporate managed. The definitive reason, the one that has provided mountaineers of all ages with their credo, was supplied back in March 1923 by George Mallory when he famously responded to reporters' questions about why he wanted to climb Mount Everest: "Because it's there." Of course, Mallory wasn't talking about just any mountain, but the one that represented the greatest mountaineering goal of the time, the highest peak on the face of the Earth. A year later, on his third exhibition to this very mountain, Mallory disappeared. His last recorded sighting was just a few hundred metres from the summit. It was to be another 75 years before his body was found. Once the obsession of a dedicated few, mountaineering has in recent years expanded its user base considerably. Consider these figures for Mount Everest alone. In 1970 just four climbers reached the summit, in 1980 there were ten, in 1990 there were seventy-two, and in 2000 one hundred and forty-six hardy souls made their way to the top. By the end of 2006 there had been a total of three thousand and fifty successful ascents to summit of this one mountain. Even armed with the knowledge from so many previous climbs and dramatically improved equipment and support, any assault on Everest is not a challenge for the timid or ill-prepared – to date, over two hundred climbers have died in the attempt. But spare a thought for the pioneers, those who ventured into the unknown with equipment that modern climbers would balk at, when access to the mountain was restricted to a single expedition per year and sometimes not even that. In 1953 that slot was taken by a British team led by John Hunt and included in its number the original expedition leader Eric Shipton, climbers Tom Bourdillon, Charles Evans, George Lowe and Edmund Hillary, and Sherpa mountaineer Tenzing Norgay. You don't have to be part of the climbing fraternity to know how this ended – Hillary and Tenzing went into the history books as the first men to successfully reach the summit of the world's highest mountain. (It's one of those nice little ironies that despite the expedition's British identity, it was a Sherpa and a New Zealander who actually set foot on the mountaintop). 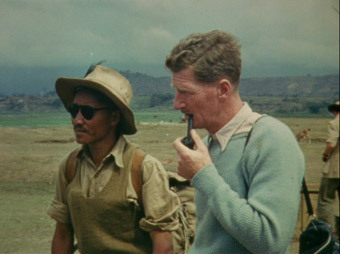 Happily for posterity, expedition member George Lowe chose to add considerably to his carrying weight (or rather that of the Sherpas employed to haul the group's supplies) by taking a 35mm movie camera and a stock of colour film along with him. On his return the footage was edited, a score commisioned and a narration written and recorded. The result was Conquest of Everest, a very British, very 1950s, but still captivating record of a landmark achievement and one of the key events in mountaineering history. 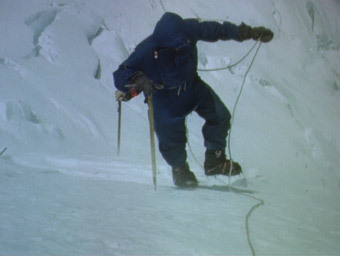 Part of the film's fascination in a time of high-tech mountaineering is its record of the equipment the 1953 team had to work with, some of which, such as the tie-on crampons and Heath Robinson oxygen tank support cradles, look almost home-built. The image of old school British explorers out for a bit of an adventure is momentarily suggested by the sight of a pipe-smoking mountaineer in knee-length shorts, but it soon becomes clear just how how professional the climbers and how carefully and thoroughly planned the expedition were. Their only real stumbling block proves an underestimation of the full effects of oxygen deprivation, which is understandable given that no-one had ever climbed to and returned from that height before. A sometimes heroic commentary, written by Louis MacNeice and spoken by actor Meredith Edwards ("What they are carrying also" he says of the heavy packs hauled by the Sherpas, "is a dream that is turning ripe"), a dramatic and emotive score by Arthur Benjamin and some unsubtle sound effects (the wind is never less than deafening) nonetheless drive the film forward and communicate very effectively the experience and difficulties of the climb. Useful information on the route is provided by John Hunt, with Hillary giving a matter-of-fact description of his and Tensing's arrival at the summit, a key moment somewhat inevitably missed by Lowe's camera, although the reunion with their waiting colleagues strikes a suitably triumphant note. Lowe's colour cinematography is often striking. This is no mountaineer-with-a-camcorder imagery, but carefully composed and sometimes arresting footage that captures both the beauty and the danger of the landscape. The scale of the party's task, already made to look impossible by a graphical sequence comparing Everest to St. Paul's Cathedral, is wonderfully illustrated by a seemingly endless tilt up from the small figures of the walking mountaineers to the towering height of the mountain's peak. But Lowe also captures faces and activity of the party and the local people, never foregetting that the mountain, for all its magnificence, is the setting rather than the star. An as-it-happened documentary of the old school, shot silent with sound effects and narration added later, Conquest of Everest is going to feel dated to those who have come to documentary features via the more aurally and visually busy works of recent years. But like Thor Heyerdahl's similarly styled Kon-Tiki, it works precisely because it's all about the story, not the manner of its telling. Framed 1.33:1, as near as dammit to its apparent original ration of 1.37:1, dust spots and the occasional scratch are almost inevitable for a documentary work of this period – the surprise is how unobtrusive they are and how good the picture looks otherwise. Detail is a touch soft on some of wider shots but elsewhere is very good, and the contrast is just right. The colour reproduction varies a little, a touch muted in places but when the prime colours are on display, as in the opening coronation footage, the Technicolor print is vibrant. The Dolby 2.0 mono soundtrack shows its age a little, mainly in the music, which lacks full bodied punch of a more modern track and occasionally gets a little wobbly. The narration is always clear, though, and the soundtrack itself is free of crackle. None. A bit of a shame, this, as there must be plenty of scope for the inclusion of textual features about the mountain and/or the expedition, archive footage of previous expeditions (a short extract is included in the film) and a retrospective documentary looking at the significance of the team's achievement. Just a thought. Invaluable as a historical document, Conquest of Everest also holds its own as a straight documentary, and I do mean straight – there's no postmodernist tomfoolery at work here. Mountaineers and documentary enthusiasts will already have this on their shopping list – a shame a bout the lack of extra features, as a little work in this area might have seen the disc reached a larger audience.